I had a difficult time trying to choose what to pack for the holiday I’m off on, well, today! This post is scheduled, as usual, with my holiday posts =D Because the weather has been so odd here recently, and is very similar in Paris, it was really difficult. It’s only just stopped snowing a couple of days ago, so I definitely don’t want to be in spring/summer clothes, but then again, it could be fairly warm since it is April after all, so I need layers that can be removed if necessary. We also have a variety of different ‘themed’ days, so I’m prepared for those too! 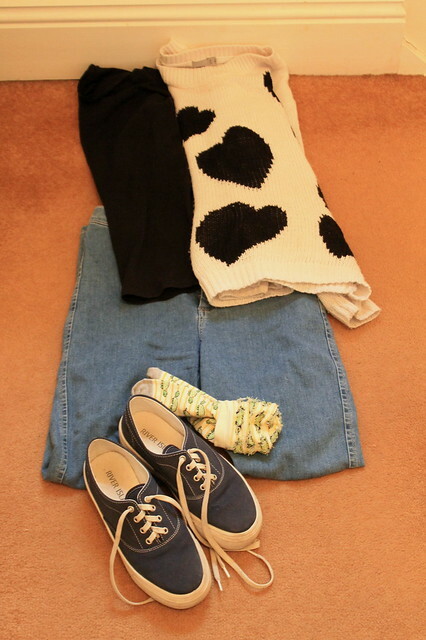 So here are the clothes I have packed with most of the outfits I plan to wear and a little explanation of each. I also didn’t include my other coat I’m taking, which no doubt will be worn over nearly every outfit, but it’s the Primark coat worn here. This is the outfit I’m wearing to travel down to London in – I’m going to straight to the station from work, so I needed something work appropriate, but also comfortable for the train journey in the evening. 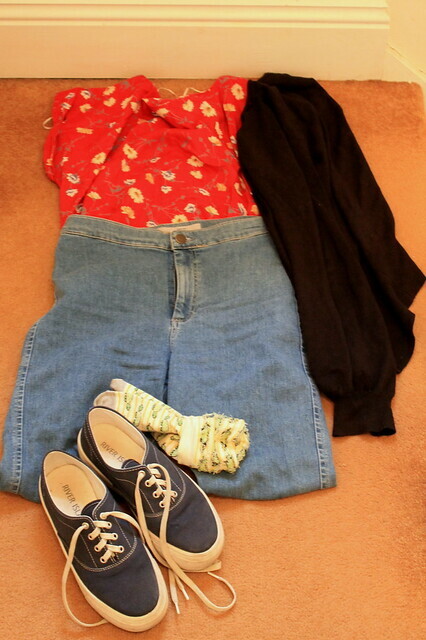 I’ve added the heels because this way it’s a possible evening outfit for one of the days in Disney. I’m planning to wear this for the journey across the channel – it’s a comfortable outfit I’ve worn several times already (oops! ), but will be good for sitting on a train most of the day! The jeans will obviously be very versatile for wearing in the parks for chilly days and good for the rides! This outfit will actually be up on here (on me!) in a couple of days. Another simple but comfortable outfit for long days out at the parks. I decided I should definitely have some comfortable walking shoes, so these are them! A variation on the above outfit (got to be able to wear everything in a variety of ways!). The denim skirt can be dressed up or down, and can be worn with the top from two outfits above too. 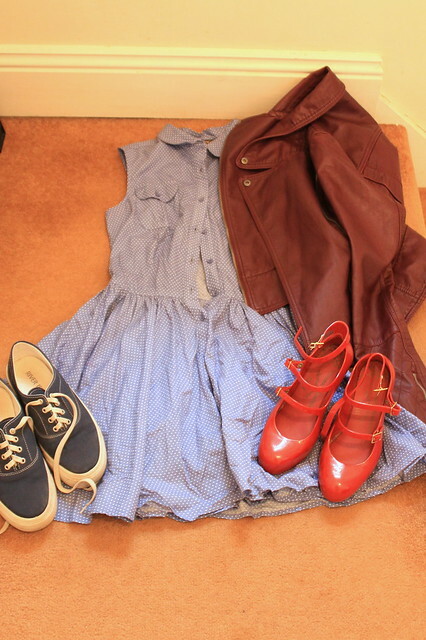 A slightly more dressy look, so can be for daytime or evening, and could go with the black Dorothy Perkins flats too. It will, of course, be worn with tights, don’t worry! Not sure whether I’ll be wearing this during the day as I planned or not, but I couldn’t resist packing this skirt! I feel like it’s a bit too short for work and wanted an excuse to wear it! 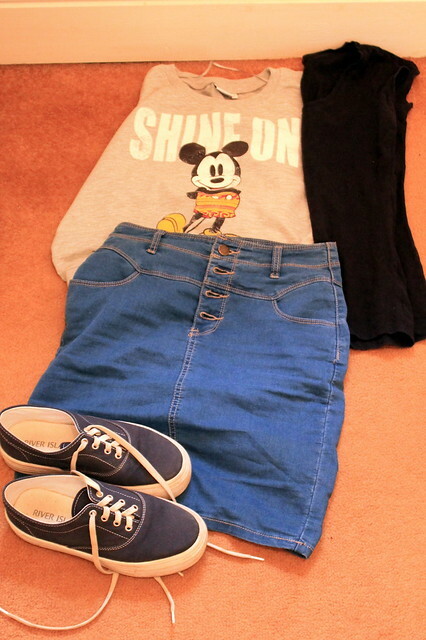 Another basic daytime outfit, but I couldn’t not take the Mickey Mouse top, could I?! Can be worn with the jeans too. Definitely evening wear – can be dressed up or down with heels, depending how I feel! Could also throw the Motel jumper over the top of the dress. For our Minnie Mouse day!! We’re all planning to wear our Minnie Mouse dresses and seek her out on this day =D I’ve got a long sleeved top to go underneath the dress as well as the cardigan, just in case! Another themed day – Princess Day! I’m planning to be Rapunzel from Tangled. Not the best costume in the world, but it’s close enough. I was going to be poor Cinderella but didn’t like how the outfit looked in the end. So that’s all! We’re there from Tuesday to Saturday, so some of these outfits will be worn with a couple of changes probably made. And I’ll probably throw in a couple of random pieces before I go since I have the space for them anyway! Do you think I’m missing anything?! It’ll be too late now anyway, since I’ve scheduled this for Monday, and I’ll be leaving on Monday evening, yay!! Love the prints! I wish I was going to Disneyland in Paris. Oh wow I love Disneyland! Hope you have a fun trip!